We have a wide range of content to fulfil your teaching needs. Assessments There are a range of assessment options available that can include different media, question styles and reporting options. Lists These are useful for learning words and phrases. Smart Lessons The content of these lessons are more flexible than that of lists. They can contain a number of different kinds of media and question styles. For Smart Lessons and Assessments, questions can be split into either self-marked or auto-marked. With Smart Lessons, these are self-marked by the student and can also be opened to peer review. Self-marking can also be enabled for Assessments, but these are marked by a teacher by default. For Assessments, auto-marking is done automatically where possible, but you're still given the option of overriding these marks. Multi-choice A question is presented and student must select the correct answer. Fill-in-the-Gaps A passage of text with one or more words omitted from it are displayed along with a number of possible answers which need to be dragged into the correct space. Highlight Different sections within a passage are highlighted which students are to select between based on a question prompt. Annotated Questions are posed on sections of a passage of text and students are required to select an answer from a list (similar to multi-choice questions). Long-Answer Students are asked to write one or more sentences based on a prompt. Sound Recorder Students are asked to record a verbal answer to a question. These are particularly useful for learning and testing pronunciation. Scratchpad Students are asked to draw something based on a prompt. 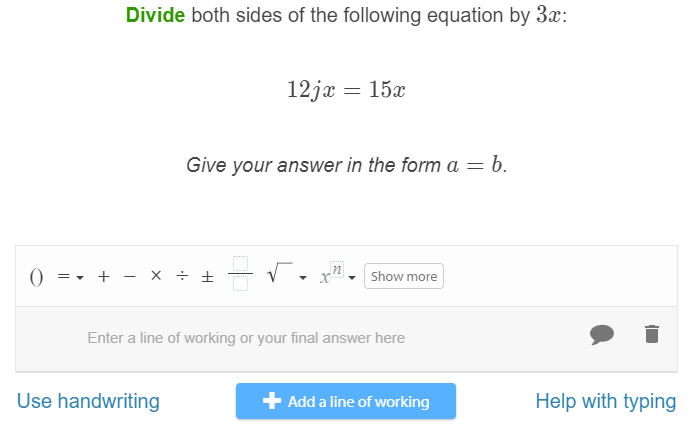 Maths Input Questions Students are required to answer a question and show their working. These questions are complex to make and they can't be made in the Express Editor. If you would like to create a Lesson or Assessment with one of these questions, we recommend you get in contact with us at content@educationperfect.com. All Lists are entirely auto-marked. Translation Lists Translation lists help students revise their vocabulary. You can easily set up your own translation lists by typing them out, importing them from another list or spreadsheet, or emailing them through to us at content@educationperfect.com. Our translation lists include native speaker pronunciation and are designed to encourage spaced repetition. Students are awarded points for learning a word and for revising words over time. Click here for more information about our points system and how it ties into long term retention of vocabulary. Fact List Fact Lists test technical vocabulary and are exclusive to non-language subjects. Just like a Translation List, you can type out your own information or import from another list or spreadsheet. Spelling List Spelling Lists test spelling. Each word is paired with a sentence to give words more context. You can either create your own set of spelling words or import from another list or spreadsheet.